Manuel Mazo was the winner in the Spanish Poker Championship in the Casino de Murcia. Gorka Calvete finished runner-up, after making a deal after Mazo eliminated Vicente Ruiz in third place. Manuel who had only played in free rolls and small tournaments until now, finished as chip leader in the day 1A of his first ever performance in a main championship. He started the final table in second place and survived to finally secure the title. In a decisive hand, Vicente Ruiz raised and after thinking for a few minutes, Mazo decided to call with (6-Diamonds) (6-Clubs), only to find that Vicente had (A-Diamonds) (10-Spades). The table did not improve Vicente's hand and he busted. Heads-up began for Manuel Mazo and Gorka Calvete. They immediately decided to do a deal for the prize money and Manuel got the title as he had the chip lead. The Spanish Championship presents a continuous ranking in which Fernando Martin is in the lead with 65 points, followed behind by Julio Díaz with 59. 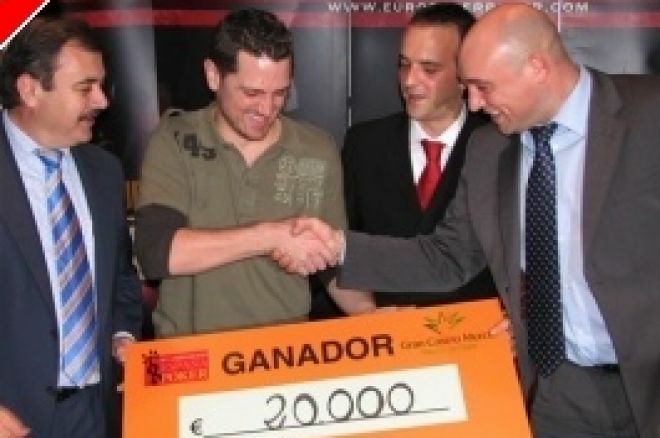 The main title will be awarded on the final event which will be hosted in the Casino Gran Madrid in Torrelodones, where they will claim the second ever Spanish Champion, following the current champion Francisco "Pakito" López. The final will take place from 14-16 December and it will be a €2.000 buy-in tournament. Win 1 of 50 Tickets to WCOOP Events in Our Special Giveaway Freeroll! The Asian Poker Tour and ChipMeUp have an Exciting Announcement!